He’s under a haystack, fast asleep. This nursery rhyme refers to a common predicament in village life - the problem of how to deal with stray animals and the damage they caused. The sheep-on-the-loose may well be in a meadow, munching hay while a rampaging cow could run amok in the cornfield causing swathes of damage. A trespassing or stray animal - be it a horse, pig, cow or goose - was rounded-up and taken to the village pound by the local constable (aka ‘Little Boy Blue’). 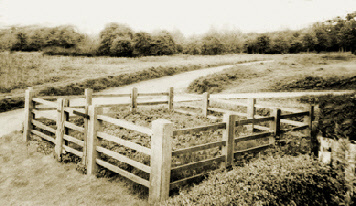 This was a small pen (Saxon, ‘pun’ - an enclosure) which was ringed by a fence or wall (see two road-side examples below). The pound, probably strewn with straw and grain, was a holding cell for animals. As with Noah’s ark, one wonders how the diverse inmates of the pound would have interacted. 2) The manorial records mention outbuildings associated with he cottages. The maps of Preston dated 1816 and 1844 show such outbuildings but not around the cottage at the junction of Back Lane and Crunnells Green. 3) The manorial roll refers to ‘waters’ on the property of the School Lane property. The 1898 map of Preston show a pond near this property - just to east beside School Lane. Were the occupants of the cottage “near the pound” (i.e. Joseph Sharp, Edward Andrew and William Barker), the pound-keepers of Preston? To release the detainee, its owner had to pay fees to the pound-keeper and the Lord of the Manor and a fine for damages - which no doubt resulted in tears for any awakened boyish custodians of the animal. Any animals not redeemed were taken to market and sold; the proceeds being kept by the pound-keeper. A similar procedure today is when a car is illegally parked and the police arrange for it to be taken to a (com)pound from which the vehicle can be redeemed by the payment of a fine. Perhaps the feelings of an offending motorist were similar to those of the impounded animal’s owners. 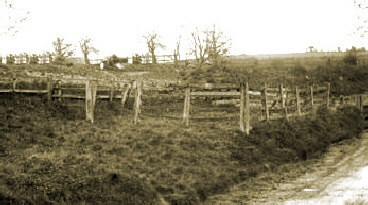 Certainly, it was a common crime for the village pound to be ‘broken’ ; however it would have been simple to prove the offence when the owner and his property were discovered together. Did Preston have a pound? If so, where was it located? The Temple Dinsley manorial records contain the answers - therein are the only references I have found to Preston’s pound. Even the approximate location is recorded in the roll. 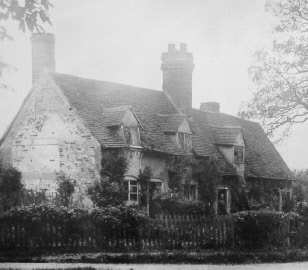 At a manorial court held on 22 October 1788, a note was made of the sale in 1770 by Edward Single (a carpenter of Fox Hall, Ippollitts) of a cottage at Cranwell Green (sic) near the pound which cottage had been ‘occupied by John Sharp and now Edward Andrew’. The property included, ‘outbuildings, barns, stables, yards, gardens, orchards, waters, fences and ditches’ and was purchased by Thomas Arnold of Great Wymondley. By 1793, the property had been inherited by Thomas’ son, William Arnold, who then sold it to Henry Mardlin, a yeoman of Kings Walden. Six years later, in 1805, Henry bought another two cottages (which had, ‘outhouses, buildings, yards, commons and commodities’) at Cranwell Green. 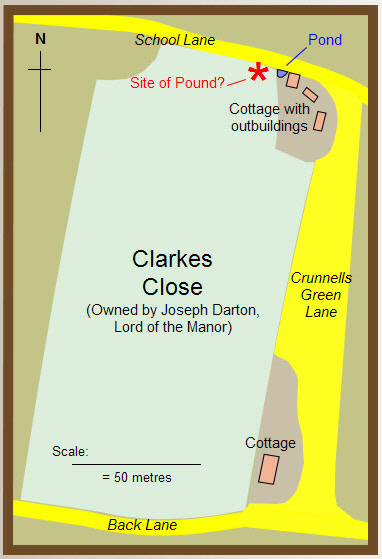 The manorial court went on to record that by 1807 Henry had converted the three cottages into one which was purchased eventually by Joseph Darton of Temple Dinsley. There were only two properties to which these transactions could relate - both standing to the east of Crunnells Green; one near School Lane, the other by Back Lane. 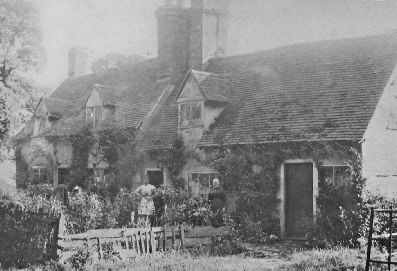 There are several reasons to conclude that it was the cottage at the junction of School Lane and Crunells Green which featured in the manorial roll.